Located in close proximity of Olomouc, in the heart of Moravia, Best Western Hotel is 5 kilometres drive to Aquapark Olomouc, a popular water park and Moravian Theatre, a perfect place to enjoy movies. The Modern Art Museum, the city fortress and the Natural Science Museum are also worth visiting. This property features spacious guest rooms that are equipped with standard amenities such as cable TV, hairdryer, ironing board, alarm clock, cable TV, mini bar, coffee maker and a telephone. 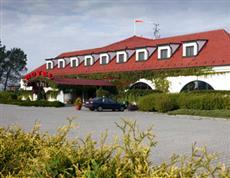 Best Western Hotel Pracharna in Olomouc offers delicious cuisines served at the onsite Restaurant Pracharna.